(his last film) as a bad guy. This week I did something for the first time in my life which millions of people do every single day: I walked a dog. You may wonder how it is that a guy like me could spend 43 years on this planet without ever once walking a dog. But it's actually not too difficult to avoid taking any responsibility for a dog if you don't like dogs and have never lived with one before. And it's not like I've never walked alongside a walking dog... I've certainly gone along with someone else while they walked their dog... but until now I've never had the full experience of putting on the leash and going out with the dog, just the animal and me, for a walk. You see, I have never really liked dogs. I'm a cat person. Dogs have always struck me as being not just annoying (barking, slobbering, hyperactive, needing to go outside all the time, etc) but also dangerous. When I was a kid, my friends in the house across the street had a huge dog, a big scary Doberman I believe, and I lived in fear of it. I think there may have even been an incident when I was tiny in which I was knocked down or otherwise terrorized by this or some similar dog. I've had very few positive dog experiences, and generally have always said that I hated dogs. However, I'm changing my tune. I'm learning to like dogs. A couple of famous people have also been helping me with this attitude adjustment. One is Cesar Millan, whose TV show The Dog Whisperer has given me a much better understanding of how dogs think and what they need than I've ever had. Whereas I've always just feared and shunned dogs, I'm now learning how to understand and properly interact with canines! I actually found it exciting to see how well this guy Cesar can speak the secret language of dogs... it's amazing to see how quickly he can become friends with the "bad" dogs that people call him in to help them deal with. It gives me the feeling that I too can learn to communicate with these beasts. Less specifically helpful -- but I think even more inspirational -- was an article I read a couple of years ago, by Ben Stein, called "Christmas Peace." In this essay, Ben talks about the various things he's grateful for, and about the accomplishments and joys in life which make him happy... and he comes to the conclusion that nothing, for him, beats the love of a good dog. "There is a magical connection between dog and human that offers a glimpse of heaven," he wrote. This is a guy who's done it all, having had successful careers in both politics and show business, a man who has experienced love and fatherhood as well as fame and fortune... and he says that knowing the "warm, unconditional, devoted, peaceful love" of a dog is the very best thing that life has to offer. "You have not fully taken advantage of God's gifts if you don't," wrote Ben. I was really struck by that, since I have never known this joy. And then there's Nessa. 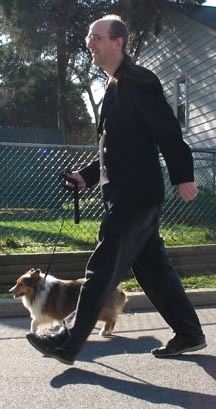 She's the Shetland Sheepdog (often called a "Sheltie") I've been out walking with all this week. Nessa is the dog of the boyfriend of Luisa, and since they've gone to Mexico for the holidays, we are currently in the middle of a 3-week in-home experiment in living-with-a-dog. And it's going well! Nessa is a totally sweetie of a dog, so she's making it easy. And I'm finding that I actually enjoy going out with her for little walks around the block, much more so than I ever expected I would. But what about the cats? How are they coping with this canine invasion? As well as can be expected, I suppose... actually, I like to think that it's helping LittleCat and Shiro bond. 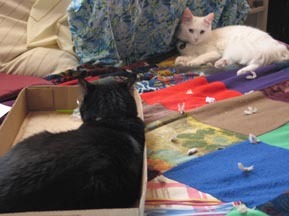 Here's a photo of the two of them sitting amazingly close together on the bed in a room where Nessa cannot go... so maybe there's some validity to what I've been saying about the cats becoming united by a common enemy. At the end of the day, my biggest reason for wanting to learn to like dogs is Alison. She's been living with us for almost 8 years now, and she's been wanting a dog the whole time. Since Kristin and I love Alison and she wants a dog in her life, we've both been trying for a long time now to get our brains around the idea of letting a dog into our house. I think Kristin's been ready a lot longer than me... but at last, I'm ready, too. We're going to get a dog! I wondered recently why Peter Jackson isn't working on a movie of the Hobbit... turns out he was, but got fired! According to what I read in Newsweek, the studio is apparently moving forward on the film without him! I hope they don't mess it up!